The Kyocera FS-C2126MFP is a speedy multifunction device with user-friendly operation and a network-ready interface. It comes with built-in fax unlike its predecessor, and it is also ideal for a busy medium-sized office that requires high quality colour output. However, it is quite expensive and there are some issues with the design. This is a colour multifunction device with a 600x600dpi multi-bit technology resolution, which can be enhanced to 9600x600dpi. The Kyocera FS-C2126MFP weighs 36Kg and measures 514mm wide, 580mm tall, and 550mm deep, and at its centre is a cluttered operator panel, which almost follows the length of the entire flatbed scanner. The device runs on 768MB of RAM while being powered by a 667MHz processor. There is a 50-sheet multipurpose tray and a 250-sheet paper cassette. The output bin can handle up to 250 sheets of A4 paper at a time. It scans, prints, copies, and faxes, and it can easily be shared by a medium-sized workgroup through a network. 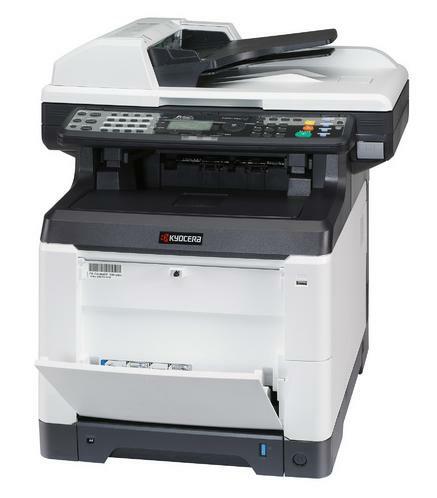 The drum life of the Kyocera FS-C2126MFP is up to 200,000 pages, so it is also ideal for high volume output. The device is secure and can scan images directly to a USB thumb drive. The memory is upgradeable to 1792MB, while the maximum input capacity is 1,300 sheets with two optional paper trays. Two-sided printing is a built-in feature in the Kyocera FS-C2126MFP. The print speed is up to 26ppm in both colour and monochrome. There are no further options to expand the memory or the paper capacity of the Kyocera FS-C2126MFP. Some users might have difficulty with on-board configuration because of the small, monochrome display screen. The Kyocera FS-C2126MFP requires more installation space in front. There is no wireless networking option which is becoming more popular with competing devices.